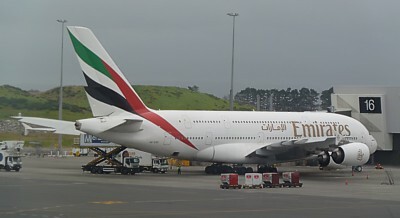 Emirates has made Auckland its second hub - most flights to Australia carry on to New Zealand. However this creates a major log-jam at the small and rather run down airport, where there aren't enough gates for the rush of flights in and out at lunchtime. 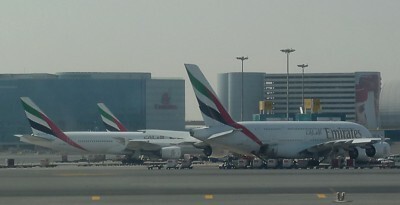 At one point, there can be six Emirates planes on the apron. To get around this, most Emirates planes disembark some distance away from the terminal, and use coaches to ferry passengers to the building. 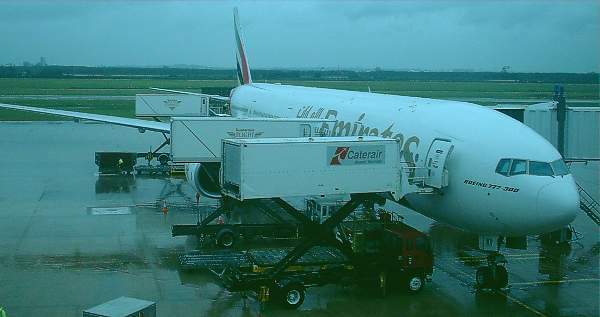 The airbridge is reserved for the A380 from Sydney. Accordingly, it can take over an hour to get off the plane, with passengers at the back of the aircraft waiting longest. You may need to time your onward transport accordingly. If you are travelling in Business or First class, you can take advantage of Emirates chauffeur drive service. With this you are offered a car to pick you up at your origin, and deliver you at your destination. It is a great perk, but there is little publicity about it. You need to either book this online once your ticket has been confirmed, or just phone Emirates. There are no mileage restriction within the United Arab Emirates, but other than that the mileage limits for this are a little random: around London, it is offered within a 70-mile radius of LHR, however it is 40 driven kms of Sydney, 60 driven miles of New York JFK Airport, and 30km outside St. Petersburg. If you are taking advantage of Emirates chauffeur drive service at Heathrow can now make use of the LHR Arrivals lounge, outside Terminal 3, and offers facilities including tea and coffee, drinks and snacks, newspapers and magazines, a business area with computers, and free wifi. 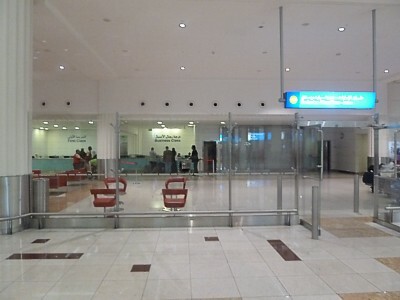 There used to be an Emirates arrival lounge at Dubai, however it was closed as so few people used it. There is now just a very spartan counter for Chauffeurs, with separate queues for Business and First. It is just after immigration and customs: turn right, and join the queue. Beware of the loophole that Chauffeur-drive is not available for passengers travelling solely between destinations in Australia and New Zealand (known as trans-Tasman routes), however for passengers travelling beyond Australia and/or New Zealand on Emirates, but making a stopover in Australia, you can use the Emirates Chauffeur-drive service. Emirates, like a number of Gulf airlines, often fly large families of very rich, and very influential Sheikhs. They will almost always sit in First Class, and will generally board early - very early - and sit where they like in the First Class cabin. This can present you with major problems if you spend as much time as possible in the lounge enjoying the Sparkling Wine, and board last. Often, there will be a Sheikh asleep in your First Class seat. They will absolutely refuse to move, and rarely will wake up. Remember that it is a high insult to shake a Sheikh awake. Complaining to the crew is equally pointless, as they will do absolutely anything to avoid insulting their honoured guests. Accordingly, there are really only two possible routes: either do as they do, and sit in someone else's seat, or board early too. If you board early, this also avoids the problem that they will self upgrade their family members, and if you board late, you might suddenly find yourself getting a downgrade. One of the common questions is "How do I get an upgrade on Emirates to Business or Club class?". Alas, getting upgraded to business class on Emirates really isn't that easy. The airline has the Western, rather than American, model for upgrades longhaul. Which is to say you'll only get an upgrade if your paid for class is full, and then upgrades are processed accordingly to a pecking order of elite frequent flyer status. You are very unlikely to ever get an upgrade unless you are at least a Gold Skywards member. To start with, make sure you are a frequent flyer, and you do fly frequently: after all, if Emirates are going to upgrade anyone, they will upgrade those passengers who fly with them pretty regularly, and hence will enjoy the upgrade enough to put more business Emirates's way. Then if the flight is full in economy, and someone needs to be moved up, the check in staff will first look at Gold members, and then Silver level. Another thing that Emirates look at is how much you paid for your ticket: it's much more likely to happen with a full fare ticket (although occasionally you can get lucky with a discounted economy ticket). On Emirates the airline has heard - probably hundreds of times a day - requests for an upgrade: the general consensus seems to be that if you ask for an upgrade, you're less likely to get it, although opinions differ on an upgrade strategy for Emirates. As always, my advice on dressing properly in the pages on how to get an upgrade applies. Emirates website is very flashy, with lots of animation. The graphics on the new A380s is particularly good, with nice pictures of the First Class cabin. It is possible to book flights online, and to check your Skywards miles balance. Alas, there are no online flight entertainment listings.